Was browsing and reading articles recently about art and seeing and found this image. 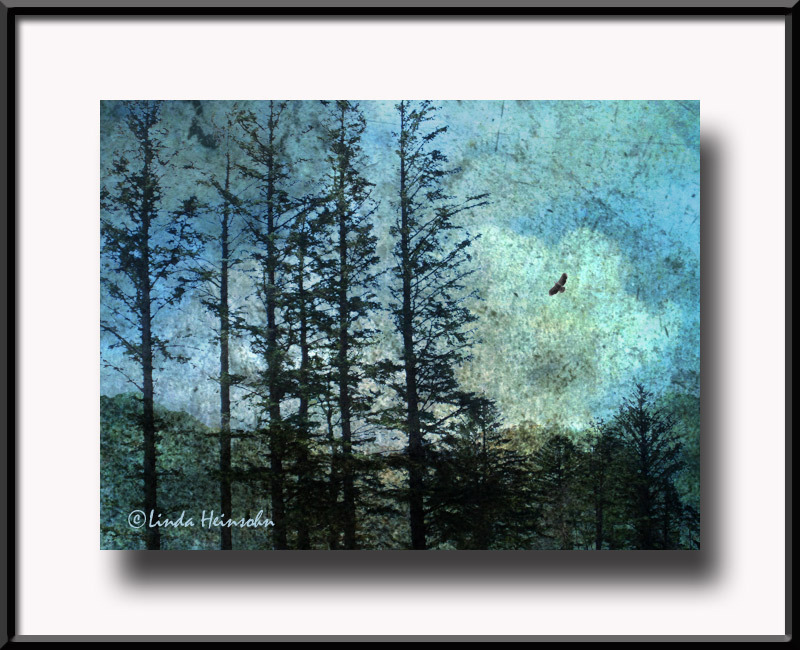 It reminded me of photomontages Carol Leigh has taught me to do in her online classes. I wondered if I could capitalize on the inspiration I felt seeing this art to make my own. Should be a piece of cake to translate, thinks moi. I picked a photo of a scruffy piece of rusty metal as background, a Lost and Taken free texture, a photo I took at Fort Stevens or Fort Columbia last year of tall trees, a cloud photo from the tons of cloud photos I make all the time, and photo of a bald eagle. Took a bit of experimenting to settle on these photos and to find the best combination of blending modes. As you can see, it's a completely different feel from the inspiration piece but still qualifies as art, I think! It's lovely. Definitely a Pacific Northwest vibe running through it. I like the trees and their concept of "up," which ties in with the bird flying high. Hoo ha! You're on your way!